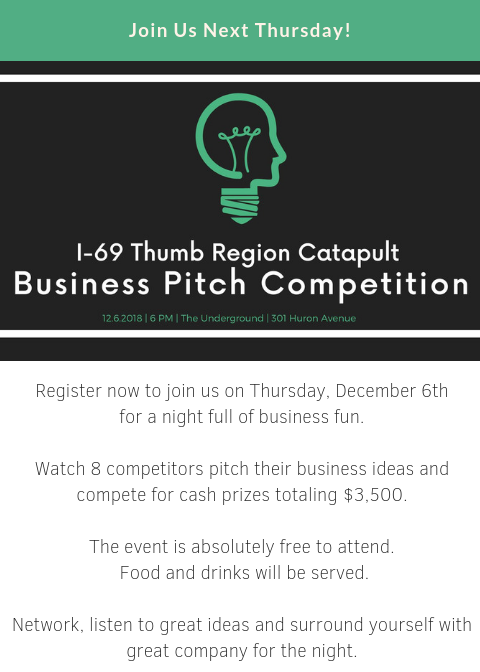 The applications are in and eight entrepreneurs from across St. Clair County have been selected to pitch their businesses at the I-69 Thumb Region Catapult Small Business Competition. Representatives from the seven counties that make up the I-69 Thumb Region will compete for the top prize in January 2019. But first, entrepreneurs must win their own counties’ local contests. Participating counties include Genesee, Huron, Lapeer, Sanilac, Shiawassee, St. Clair, and Tuscola. The St. Clair County contest is scheduled for Thursday, Dec. 6, at The Underground business incubator in downtown Port Come hear some strong business pitches from local entrepreneurs.Huron. The event is free and open to the public and will feature food, drinks, and networking opportunities. The eight St. Clair entrepreneurs are vying for $2,500 first place and $1,500 second place prizes. The winner will then go on to the regional summit to compete for $6,000 in first place, $4,000 in second place, and $2,000 in third place prizes. The Industry, Josh Sabo: A non-profit that helps 17 to 25 year olds hone talents, skills, and character to become employable community leaders. Winsom Rewards, Chris Smith and Michael Sharber: An app that motivates users to get to the gym and exercise. 4ever2, Patrick Coughlin: Uniquely-designed interlocking wedding bands that the company says are more comfortable than traditional wedding bands. Hantoon’s Munny from Hanton LLC, Mark Hanton: A local honey mustard sauce. Golden Laser Designs, Gregg Masters, Jr.: A custom laser-engraving service for products that include acrylic, glass, leather, and more. South of Heaven Beverage Company, Keith Gram: A line of health-conscious and environmentally responsible beverages. Its first is a bloody mary mix. Niche IX, Dairoll Medrano: A Visual, Performing Arts and Technology Boutique and cooperative space for area artists, musicians, and more. Activio, Robert Frisch II: A directory website for the adventure tourism market. Though the event is free and open to the public, those interested are encouraged to register online. The Underground is located at 301 Huron Ave., Ste. U, in downtown Port Huron.